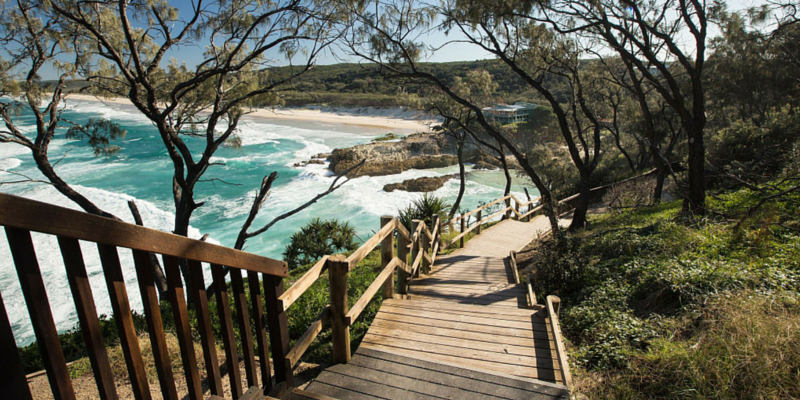 The best land-based whale watching location in Australia, North Stradbroke Island’s Gorge Walk, will get a $600,000 upgrade. Main Roads Minister Mark Bailey announced on Tuesday the Gorge Walk Trailhead Lookout was one of 28 scenic lookouts around Queensland that would receive funding. “The Scenic Lookout Upgrade Program was set up to help local council’s revitalise existing lookouts across Queensland,” Mr Bailey said. The funding for the Gorge Walk upgrade is a 50:50 partnership between state government and Redland City Council. Redland City Mayor Karen Williams said the funding was great news for local tourism. “North Stradbroke Island is one of Queensland’s most beautiful natural wonders and the Gorge Walk provides a beautiful vantage point to view the natural wonders of the island and Moreton Bay,” she said. Mr Bailey said 38 submissions were received from local councils for the funding. The proposals for 28 scenic lookouts in 25 council areas were successful. “All sites were assessed against set criteria and prioritised by the Department of Transport and Main Roads in consultation with the Department of Tourism, Major Events and Small Business,” he said. The Gorge Walk upgrade received the highest funding at $600,000, with the next highest upgrade funded at $400,000. Division 2 Councillor Peter Mitchell said the council would match the government’s $300,000 in funding, with the project to include a new viewing deck for whale watching at the beginning of the Gorge Walk. “The new viewing platform to be built as part of this project will ensure (the gorge) continues to attract people from all over the world to view the local marine life,” he said. Cr Williams said projects like the upgrade were critical as Straddie transitioned from sand mining to tourism. “Tourism is vital to the future of the island and investment from all levels of government through projects such as this is critical to building a strong economy,” she said. Cr Williams said the project would complement the council’s recent works to improve public access on North Stradbroke Island. “The Straddie Gorge Walk is a $2 million project jointly funded by council and the federal government over three stages with the final stage completed last year,” she said.